Kalani Brown — the daughter of an NBA star and mother who played collegiate basketball with one of the legendary programs of the game before turning into a coach — wasn’t going to be able to avoid her legacy completely. Her mother, Dee, coached her from the time she was six years old. But she would make sure she was doing what she wanted to do, as well – so there were piano lessons and dance lessons and volleyball. And then the legacy became the love. Brown, the 6-foot-7 center from Baylor, closed out her collegiate career Sunday with an NCAA title, posting 20 points, 13 rebounds and 2 blocks in the championship game. 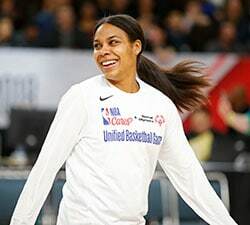 On Wednesday, she is expected to be one of the top picks in the WNBA Draft 2019 presented by State Farm. Her size, physicality, agility, and strength both on the boards and in the paint is going to make her a coveted young talent for teams looking for an anchor in their post or depth in the paint next to a veteran who can mentor her into dominance. Brown has been focused on her team’s magical NCAA tourney run, culminating in her first trip to the Final Four and first title. Getting there has lifted a weight she has been carrying for four years, since she got to Waco with big expectations from both herself and her hard-driving head coach, Kim Mulkey. But now it’s time to change gears and focus on something new, her about-to-begin life as a professional basketball player. She joked over the weekend that she hadn’t even begun shopping for her Draft Day outfit yet. Brown was in elementary school, a wide-eyed 9-year-old, when she sat in the stands back in 2008 and watched her father, P.J. Brown, play in the only NBA Finals of his 15-year career with the Boston Celtics, winning his only title. Her mother, Dee, played at Louisiana Tech for now-Baylor head coach Kim Mulkey before turning to coaching. She coached her daughter in youth basketball, AAU and was an assistant on her high school team. Kalani, who lived in five different cities in her childhood as her family followed her dad through his career, had been attending Baylor basketball camps since she was a kid, and said that Mulkey had her eye on her since she was in the sixth grade. When she got to Baylor, she was a nice kid — who played that way. “But coach Mulkey definitely put that dog in me, that aggressiveness,” Brown said. Brown, who finishes her career as a two-time All-American, averaged 15.6 points and 8.1 rebounds this season, shooting 61.3 percent from the floor as she shared post duties with fellow standout Lauren Cox. Her left-handed, back-to-the-basket style is called “old school” by some, but it has worked quite well for her. She is, above all, a finisher. As a junior, Brown averaged 20.1 points and 10.2 rebounds a game. Brown and Cox became the most dominant backcourt duo in the country this season. “This is the most unselfish team I’ve ever played on,” Brown said. “Anyone can go off on any given night, but no one gets upset that they are going off. 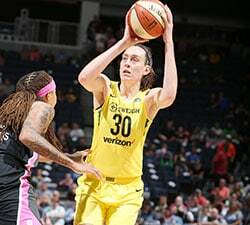 Brown, who says she is a big fan of Minnesota Lynx All-Star Sylvia Fowles, said she has been working on improving her defense of the pick-and-roll because she knows she will see a lot of it in the WNBA. “I saw a great example in Oregon (in the national semifinal),” Brown said. And the assertiveness that she learned from Mulkey, she knows she will need that too. 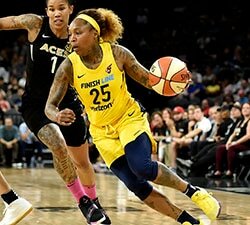 Longtime WNBA reporter Michelle Smith writes a weekly column on WNBA.com throughout the season. 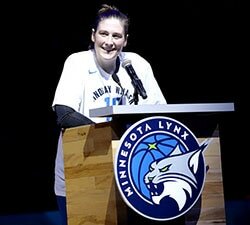 The views on this page do not necessarily reflect the views of the WNBA or its clubs.